USA Today is celebrating its 25th year with 25 lists of 25. This week's list is 25 Lives of Indelible Impact. I might have sorted the list in a different order, but these are all amazing and inspiring people from the last 25 years. Last week was 25 Years of 'Eureka' Moments -- inventions that have changed our lives since 1982. As I scanned this list, some were integral to my life, and some seemed irrelevant. I wondered what my 5th graders would make of the list, how they would sort it (important vs. irrelevant), and if they would notice anything missing. Which items on the list are most important in your life? Of the 25 USA Today picked, my important ones would probably be debit cards, pay at the pump gas and my iPod. Which items on the list are most irrelevant to you? Online stock trading, electronic tolls, TiVo, Big Bertha golf clubs, home satellite TV and karaoke are all at the bottom of my list. 1. My favorite colors in nature are the purple of a post-thunderstorm sky and the bright green of the freshly washed leaves against that purple sky. 2. My favorite landscape in nature is the flat, arid, emptiness of the western plains. That's where I grew up and it seems to have become a part of my psyche. 4. My favorite exercise is swimming. I am addicted to the shock of the cold water and the smell of chlorine. 5. I love the art of Laurel Burch. 6. I own a polka-dotted purse. 7. I have a freckle on the palm of my left hand. 8. One of my favorite books as a child was Just Plain Maggie by Lorraine Beim. I still have the 1967 Scholastic edition of this book ($.35). Did anyone else ever read this? 1. I carry a flashlight when I stay in a hotel, in case the electricity goes out. 2. I have fallen off of a treadmill 3 times. 4. In college, my music ed professor made me promise, in front of the class, to never sing in front of children. 5. Every Sunday, in 5th or so grade, I'd go up to my grandmother's attic to pick out another Nancy Drew book for the week. 6. My favorite movie candy is DOTS. 7. My purse is ALWAYS a mess. 8. I drink hot tea all day, every day. In the first book of the Fairy Chronicles, Beth’s dreaded visit to Aunt Evelyn’s takes a turn for the better when Beth learns she is a fairy. Marigold Fairy, to be exact. The minute we got news of this book, I knew which of my fifth graders would be the first reader. I’ve seen her with other fairy books, and she took a spell book out to recess for weeks on end last fall. All of the characters in her writing have magical mystical powers and they go on epic quests. Little did I know just how into fairies she is. She has read all of the Disney Fairies books, and owns several. She can recite the names, talents and adventures of all the Disney fairies. So it’s an understatement to say that she brought some background knowledge to her reading! She was practically giddy with excitement when I showed her the book and asked her to read it in one night, if possible. (She managed in two.) She found one way that the Fairy Chronicles fairies differ from the Disney fairies: the fairies in the Fairy Chronicles are humans who can change back and forth from their fairy selves, while the Disney fairies are static fairies. Some of the fairies in both series have similar talents. There are Fairy Circles in both books, and the Fairy Chronicles has a handy fairy profile page which I missed, but she accessed several times when talking about the book to get the details right. She made a connection to GOSSAMER by Lois Lowry, and she was surprised and pleased to find the Tooth Fairy in the Fairy Chronicles. Both of us were delighted by the Fairy Handbooks that automatically adjust the explanations and instructions so they are just right for that particular fairy and that particular age. (Magically leveled books! Hmm….) A Fairy starts with the First Fairy Handbook, moves to the Fortunate Fairy Handbook (for Fairies who are 10-12 years old and accident-prone), then the Formidable Fairy Handbook, and last of all, the Final Fairy Hand book. What pleased my student most, however, was when I told her that she could read book two before me, and she could read it at whatever pace she chose, since she had read the first one so quickly to be able to give me her feedback! Franki and her students loved it. She has lots of fairy readers in her class and they have a whole system of who gets the books next. Her students thought the illustrations were a bit like Spiderwick’s but in color. For Franki, it was like Bewitched—there could be a magical person living by her or...she could be a fairy and didn’t know it yet. I knew if I didn't read Clementine and The Talented Clementine (by Sara Pennypacker) to my fifth graders, both books would be completely off their radar. A middle-schooler reading a thin, illustrated book about a third grader and a fourth grader? I don't think so. But an end-of-year fifth grader listening to these stories? "Don't stop now!" Clementine has become the 26th member of our class. We say, "Okay, fine," and we all know it's Clementine talking. Everyone is always paying careful attention in my classroom...but not always to the lesson, and that's all right, thanks to Clementine. Choosing what to do or what to pick? Not anymore. Now we honor all our options by not choosing (N-O-T not choosing) the ones we don't want. Laxative, Fluoride, Moisturizer, and Mascara will live forever in our memories as exquisite cat names. Things that amaze us will be "astoundishing." And we will work to be more empathetic. (punchline here; rhymes with crotch). Do you know about Daedalus Books? They are "the online discount book and music store selling thousands of quality bargain books and overstock CDs for the independent reader and listener." Books, CDs and DVDs at up to 90% off! Gotta love that. There are also three from the Smithsonian Odyssey Series that look good ($3.98 each): A GOLDEN AGE: The Golden Age of Radio; THE LAST RAIL: The Building of the Transcontinental Railroad; THAR SHE BLOWS! Whaling in the 1860s. And for $3.98, why not check out THE ESSENTIAL ATLAS OF TECHNOLOGY from 2002. The information on basic technology (wheels and pulleys and the like) shouldn't be outdated. This is why my classroom is positively overflowing with books! It's been awhile since I had a really good one to share. Today's was a doozie. At the end of the day, Boy A was by the door tying his new sneaks. Real hot, fast looking shoes. I told him they looked like they ought to have wings on the heels, like that Greek god. "You know who I'm talking about, don't you?" I asked. "The Red Bull guy?" he replied. Groan. The curse of popular culture. So I had to go over to my mythology shelf and check. On the way, I asked Boy B, who was likely to know the answer so I wouldn't have to look. "Is it Hermes with the wings on his shoes?" I asked. "Uh, no. For sure not Herpes. That's a disease." 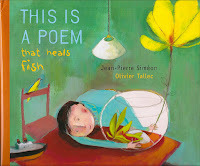 I picked up two new picture books that would be great for primary kids. 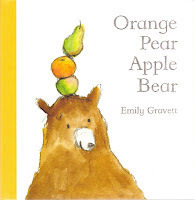 I thought ORANGE, PEAR, APPLE, BEAR by Emily Gravett was adorable. The whole story is told with the four words in the title. The illustrations are adorable and it is amazing how the author wrote the book with only four words. I actually bought it thinking it would be fun to share with older kids. I thought with all of our talk about visual literacy--with Hugo Cabret and other graphic novels, we have been talking about how readers get information from illustrations and graphics. I also thought it would be interesting to talk to them about how the author wrote a book with 4 words. The other one that I bought has been reviewed on several blogs already. 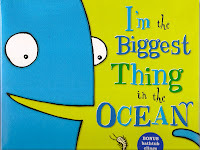 I finally found a copy of I'M THE BIGGEST THING IN THE OCEAN by Kevin Sherry. It is a VERY fun book! The colors are great. The story is fun. And the book is just oversized enough to work. 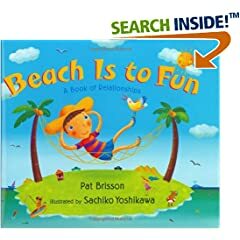 It is one of those great books that should be in every K-1 classroom because it is one that new readers can read on their own once they've heard it read aloud. As you know, I am a huge advocate of new readers reading real books rather than ONLY leveled texts so books like this one are great for these classroom libraries. Fabulous Fiesta of Children's Literature! Head on over to Chicken Spaghetti for the 14th Carnival of Children's Literature! The setting is Texas and the Carnival is (appropriately) larger than life! 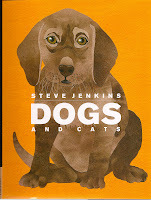 Steve Jenkins, author of ACTUAL SIZE has this great new book out called DOGS AND CATS. This is a fun book for many reasons. First of all, it has two covers. One side is the cover for the side about dogs. Flip it over and you have the cover to the information about cats. 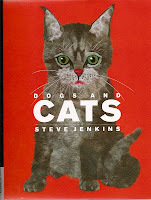 Each page is PACKED with information about dogs and cats. So much is covered in this book. And the illustrations are amazing. Labels are used to show different things and the illustrations are so realistic. I can already think of a few kids who will grab this one for reading time this week. A great addition to my nonfiction library--one that I know lots of kids will love. Another of the giants is gone. This summer I will re-read the Prydain Chronicles. TARAN WANDERER was the right book at the right time almost every time I read it through late adolescence and early adulthood. I wonder what it will say to me now. TIME CAT will continue to take my students to nine times in history. She's in 7th grade now, but when TokyoPop sent the uncorrected proof of the new graphic novel parallel series, I knew she was the expert I would need to call on for an opinion. Her life had been taken over by the middle school theater production when I dropped the book off at her house, but we had a good chat about it when she brought me my Girl Scout Cookies. The graphic novel is not exactly the same as the novels, she was quick to point out. "You wonder when Greystripe is coming back, and the graphic novel shows what happened to him. It also shows how he motivated to leave house cat life." She sees the graphic novels as companion books to the regular series. They have a mixture of new story lines and they fill in between the parts of the series. And she is absolutely savvy to the marketing of the graphic novels, "They will lure in young readers and get them ready for the series." Nevertheless, she plans to own all of the graphic novels, because they will "complete my collection...my library." She recommends the Warrior Cats website and writes: "The field guide comes out May 29. I have the new book and after today and a little of yesterday reading I am on page 167. It is so good. Also Graystripe the lost warrior (cough title of cough manga cough book cough cough cough) comes back with Millie (cough another cough cat from cough manga). There is already another book coming after this called Dark River. Now I can't wait until September because an extra book called Firestars Quest comes out. I love when you get the unedited versions when I can read them. 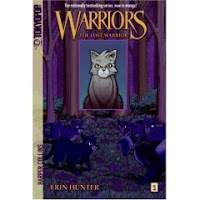 I wish I could meet Erin Hunter it would be so cool. I love lots about this book. The pictures are bright and fun. The language to describe poetry is beautiful and unique. I LOVE the message that poetry can heal. A great book for any age! At this very moment, it feels like one of the best books I've ever bought! My mom's 80th birthday is coming up in June. I'm working on a playlist (soundtrack?) for her party and I'd love your suggestions. Hmmm...I didn't realize I already had so many! Oh, well. Any other suggestions? Four kidlitosphere bloggers will present a panel session at the National Council of Teachers of English (NCTE) annual convention in November 2007. The theme of the convention is "Mapping Diverse Literacies for the Twenty-First Century: Opportunities, Challenges, Promising New Directions." Jen (Jen Robinson's Book Page), Liz (A Chair, A Fireplace and a Tea Cozy), Kelly (Big A little a) and Mary Lee (A Year of Reading) will present "Welcome to the Kidlitosphere: Reading, Reviewing and Blogging about Children's Literature" on Saturday, Nov. 17. Mark your calendars! Hope to see you there! Last year, there was big talk on the blogs about summer reading. I just wrote an article for Choice Literacy about the things I do with my class to help my kids think about and plan their summer reading. It is here if you'd like to read it. Elaine at Wild Rose Reader tagged us with a book meme: What books are you reading? Mostly True by Molly O'Neill. The biography of a Columbus girl who grew up in a family of 5 boys who were all sure they were going to make it big in baseball. One did. Molly escaped to New York City to became a food columnist for The New York Times Magazine and the host of the PBS series Great Food. Our last book of the loop -- The View From Saturday by E.L. Konigsburg. This is my gift to these 6 extraordinary readers. I hope they will go on to be extraordinary 6th graders, proud of their talents and willing to follow their passions in the face of peer pressure. Reality Leak by Joni Sensel. Review copy courtesy of the author. The Fairy Chronicles volumes 1 and 2 by J.H. Sweet. Review copies courtesy of the publisher. This week, I'm thinking of the Virginia Tech families. I'm thinking of the folks in Greensburg, KS. I'm thinking of a 1 lb. baby born prematurely by C-section. And I'm thinking of a dog who's come back from the brink. Have you heard about the Standing Women event on Sunday, Mother's Day? Women across the world are standing at 1:00 for five minutes of silence to imagine a better world. It is a pretty amazing thing. Thanks to Ann Fisher for her Dispatch article on the event in today's paper. A group of women have invited women all over the world to stand together. As I am writing this, there will be women 2284 events in 66 countries. The number keeps growing. The combination of women and good books continue to make the world a better place. I am a huge fan. Have read all of her books. Read every NEWSWEEK column . Have extra copies of a few of her books. I love her novels. I really love her essays. And, I am a HUGE fan of her little books. I purchased another copy of BEING PERFECT last night. HOW READING CHANGED MY LIFE is one of her more brilliant pieces of writing. It speaks to me and I use it with my students a lot. Last night, she talked a lot about her life as a reader. How she couldn't imagine life without reading. She talked about kids needing to find books that they care about. She talked about the fact that, for her, books never seemed like books--they seemed like places that she visited again and again. She was passionate about all she said about her life as a reader. I could very much relate! She is on tour for the new book. If she is coming anywhere near you, I would highly recommend going to hear her. Even if she isn't really close, hearing her is worth traveling a bit. We started HUGO CABRET. It was a fun day. Books from amazon arrived on time. I passed out the books. Kids shared books in groups of 2 and 3. The first few minutes were spent watching the kids lift the books up and down and talking about how heavy it was. Then they flipped through it looking for interesting thing--mentioning things they noticed. It was a tricky read aloud, I must say. I read the Intro page and then the first 45 pages were illustrations. I had forgotten about that. I wasn't sure what to do, so I had them look at those 45 pages on their own. It took a while. Then we chatted. We pointed out things we noticed, shared characters we'd met, events that had happened, setting, etc. We also discussed whether that 45 pages was "reading". It was an interesting conversation. Since there were no words, a few students did not think that they were reading. But after lots of talk, most kids agreed that, of course it was reading. They were reading pictures, thinking, making meaning, creating a story. The other tricky thing was that because they had a copy and you can look at it for hours, it was a little tough to have a conversation. We stop and talk often during read aloud. But, the kids couldn't really pry themselves away from the book to participate in the talk. The newness of the book was too fun. The kids were all pretty excited. I think it will take us a few days of this book to really settle in, stop lifting it up and down in amazement, get used to the way we'll read it together, etc. No matter how tricky this read aloud is, I can tell already that it will be worth it. Thank you everyone for your kind words and wishes for Bess. She's keeping food down and she still hasn't had any seizures. Neither the vet nor the online sources we used were exaggerating when they said to start her back on tiny amounts of food and increase what she's getting by tiny amounts very slowly. This week Kelly wrote about her book-shredding cat, Lois Lowry wrote about a coyote sighting (and gave equal photo time to Alfie), and Neil Gaiman rescued a white German Shepherd. It's been the week from gastonomic hell for our dog, Bess. She started throwing up last Sunday morning, and she didn't really stop until Thursday. She kept food down from Friday night until Sunday morning, and we're pretty sure that one was our fault for optimistically increasing the amount of food she was getting at too rapid a rate. (We went from 1/8 c. dog food with her chicken and rice to 1/4 c. dog food with her chicken and rice.) You wouldn't fault us if you could see how weak she is. She can barely stand. No, this isn't related to all of the pet food recalls, no, she doesn't have have any intestinal blockages, and no, she doesn't have any indicator of organ failure due to her epilepsy meds. The silver lining in all is, in fact, related to her epilepsy. She was having rounds of seizures every 19 days before all this. She has now gone 24 days seizure free. Could the food she had been fed since puppyhood be the cause of her seizures? Now is our chance to start from scratch with a new brand of food. We're trying one that is high protein, all natural, wheat free, and of course, made in the U.S.
Needless to say, between clean-ups at all hours of the day and night, time spent fretting, and time spent researching possible causes and new food options, very little reading and blogging got done this week. Here's hoping for a more normal week. The class was VERY excited when I pulled out THE INVENTION OF HUGO CABRET. The whole idea of it intrigued them as it did me when I first saw it. They can't wait to start on Monday. Friday, we previewed. Before each read aloud, we preview by reading the back, the blurb, the first page, the author flap, etc. Then we think about the kinds of things we might think about as we read the book. We just brainstorm all of the things that might be worth holding on to as we read-things that will be important in the books. Kids keep reading notebooks--nothing that I check or is graded but a place of them to jot down thinking during read aloud--thinking that they can go back to to comprehend the text more deeply. It is a tool that works for lots of them because it is totally up to them on how they use it. So Friday, after our preview, we charted all of the things kids planned to think about as we read. Here are the questions/thoughts they had before we started--ways they will be using their notebooks. What do the pictures tell us beyond the words? How does the invention change his life? How does the drawing connect to the invention? 2 columns to keep track of predictions and reasons I predict. How does the mysterious drawing affect anyone? He has a lot of secrets--what are they? His father's secret notebook--why is it important? Why the setting--why did the author choose it? Why is he stealing? Does he have a good reason? Poetry Friday to Celebrate the End of TESTING WEEK! It's not really a poem, it's a song, but that still counts, doesn't it?!? Larry LaPrise, the man that wrote "The Hokey Pokey" died peacefully at the age of 83. The most traumatic part for his family was getting him into the coffin. They put his left leg in. And then the trouble started. I have been trying to figure out how to read aloud THE INVENTION OF HUGO CABRET by Brian Selznick to my class. I had lots of options. I was going to use the projector at school each day but it would be hard to sign it out and get it to the room for 1/2 hour of read aloud each day. I was going to get the Audio CD that comes with a DVD. Then I found out that it had sound effects for the pictures. Sounded too much like animation to me. I want to be able to talk about what the picture tells us without the sounds that someone else put to the pictures. I thought about purchasing hundreds of transparencies and running a transparency of each page. I love sharing things that are in the world of literacy chit-chat with kids. Since Al Roker just named THE INVENTION OF HUGO CABRET as his first book club book (kids 9-11), I thought we'd jump in and be part of the fun. So, we finish reading aloud HOW TO STEAL A DOG tomorrow or Friday (more on this later--it has been a great read!). We'll preview HUGO on Monday and we'll have about 4 weeks to read and discuss it. I am VERY excited. (And, I was smart enough to get the books delivered directly to school rather than carry 10 copies of the giant book from my house to school.) So, I'll keep you posted. I think it is going to be a great end-of-the-year read aloud! Check out the great HUGO CABRET website if you haven't seen it yet. The newest Fwd:Fwd:Fwd:Fwd that showed up in my email today is the one about the new version of Survivor: 3 businessmen and 3 businesswomen are each dropped into a 5th grade classroom for six weeks. Each business person will be provided with a copy of his/her state standards, and a class of 25 students. Each class will have two learning-disabled children, three with A.D.D., three gifted children, and two who speak limited English. Two will be labeled with severe behavior problems. Eleven of the 25 will be eligible for Title One Math and four will be eligible to receive reading services...if the district can afford to offer them. Each business person must complete lesson plans at least 3 days in advance with annotations for curriculum objectives and modify, organize, or create materials according to the needs of their students (differentiating for the gifted students as well as for the lower achieving students). They will be required to teach students, handle misconduct, implement technology, document attendance, write referrals, correct homework, make bulletin boards, compute grades, complete report cards, document benchmarks, communicate with parents, and arrange parent conferences. They must also supervise recess and monitor the hallways and serve on at least one building committee. In addition, they will complete drills for fire, tornadoes, and lock downs. They must attend workshops, faculty meetings, union meetings, and curriculum development meetings. They must also tutor those students who are behind and strive to get their 2 non-English speaking children proficient enough to take the state tests (as per NCLB). If they are sick or having a bad day, they must not let it show (or spend three hours the night before writing sub plans). Each day they must incorporate reading, writing, math, science, and social studies into the program. They must maintain discipline and provide an educationally stimulating environment at all times. They will be provided with a 50-minute planning period daily while their students are at specials. If the copier is operable, and paper is not being rationed, they may make copies of necessary materials at this time. The business people must continually advance their education on their own time and pay for this advanced training themselves. This can be accomplished by moonlighting at a second job or marrying someone with money. Let's take a moment to meditate on the meaning of the word IRONIC.